Yes, that's right. "The Star Spangled Banner" needs to be retired. It has served Americans pretty well over the course of the past hundred years or so, but now, more than ever, it is time for a change. The time is nigh for a bold new direction. These are uncertain times, my friends. And things don't look to be getting any more certain any time soon. Why, then, should Americans have a National Anthem that is basically a questionnaire set to music? Sing the lyrics to "The Star Spangled Banner" to yourself right now, and think about it. The jist behind our National Anthem is, essentially, Hey, did you see that flag over there? Wow, there's a battle going on. Is it still over there? Is that really what America is all about? Does that really embody the spirit and soul of America, or at least what America is supposed to represent? "Let's Stay Together" by Al Green. I don't expect everyone to accept such a change without reservations. America is, after all, a nation of traditions. Allow me to present the justification, in a five point list. 1) The National Anthem should be a source of love and joy- look at the way Canadians smile during "Oh Canada." When you hear "Let's Stay Together," from the opening trumpets to the sound of Al Green's voice fading away at the end, it does indeed fill your heart with both love and joy. It makes your soul soar. Only a dead person, or Hitler, would remain unmoved by this song. 2) The National Anthem should make you proud to be an American. Is there any more quintessential American music than soul music? Soul music is America. I've said it before, and it bears repeating: Anyone who doesn't like soul music is Un-American and should be locked up in Guantanamo Bay without access to legal representation. John Ashcroft, back me up on this one. 3) You should want to hear the National Anthem. You should never get sick of it. You should root for Americans to win Olympic Medals just so you get the chance to hear it. You should be looking forward to hearing it at the beginning of sporting events. It is impossible to get sick of "Let's Stay Together." Because of it's inclusion on the Pulp Fiction soundtrack, which was played incessantly by just about everyone everywhere while I was in college, I've probably heard this song 14 million times. I want to hear it again right now. It never gets old. Case closed. 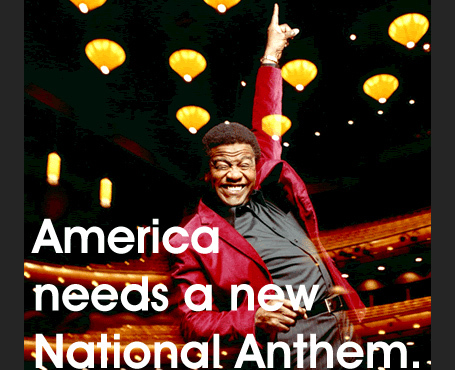 4) Who should be the author of our National Anthem: some guy locked up on a British ship, or the Reverend Al Green? I think the answer is obvious. Can I get a Hallelujah? Just close your eyes and picture Al Green singing those lines to America. Is there anything more patriotic? He loves his country no matter what she does. He wants to spend his life with his country- no fleeing to Guatemala for him, no! Again, further expressions of patriotic love. Not just a temporary love, either- this love is forever. But Al doesn't stop there- at then end, he outright promises that he will never commit treason. I wonder if Alger Hiss would have had a different life if he sang this everyday as a school-boy. No fair-weather Patriot sings this passage. Good times and bad. Happy and sad. Always love for America. That is simply beautiful. This is obviously about the Civil War. Right on, Al. This is also a reaffirmation that there will never be another Civil War. A lesson we shouldn't forget. America stands united. Hearing that again causes one to openly weep tears of love and joy and, dare I say, rapture. I think I've made my case as complete and compelling as possible. Soon, I will be drawing up the petition, and traveling door-to-door, town-to-town, county-to-county, state-to-state, in an attempt to make this critical change to our great nation. That is, assuming I can get funding for my trip, which I'm still working on. Soon, we will be not only the most powerful nation on the planet, but also the coolest nation on the planet, and the one with the most soul. By definition. Which is what everyone should want.